PYSC understands that some girls are more comfortable learning in a girl-only environment. Camps will be coached by former collegiate and MCAL standouts. Prime Youth Sports is a unique program that provides girls the opportunity to participate in sports camps and on AAU teams that are focused on giving its campers and players the opportunity to develop sport-specific skills, gain confidence, and learn the value of hard work and teamwork. Prime champions a positive environment for girls to learn and develop skills both on and off the court and/or field. Prime understands that some girls are more comfortable learning an environment surrounded by only girls. Therefore, Prime will offer exclusive girl sports camps and AAU teams that will provide an environment for all campers to learn and develop their athletic and interpersonal skills. Prime AAU teams and sports camps will be coached by female coaches, including current coaches and former athletes. 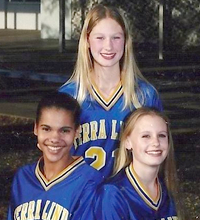 Kiki and Diane grew up playing basketball with their best friend, Lindsey Quinby. Lindsey was the heart and soul of their team and brought an energy and passion to the game every day she played. On January 21, 2012, Lindsey died tragically in an accident. Kiki and Diane continue to honor her in every way possible. Prime understands that not all campers and their families can afford to participate in activities, however Prime does not want finances to be the reason any player or camper cannot is unable to join Prime. - In honor of Lindsey, Kiki and Diane have set up the "Q Scholarship" for campers that embody Lindsey's enthusiasm and spirit and who want to attend PYSC. - If you think that you qualify for the "Q Scholarship" Please send a 2-3 paragraph email to primeyouthsportscamps@gmail.com explaining why the camper is deserving of the Q Scholarship." Please title your email "Q Scholarship".